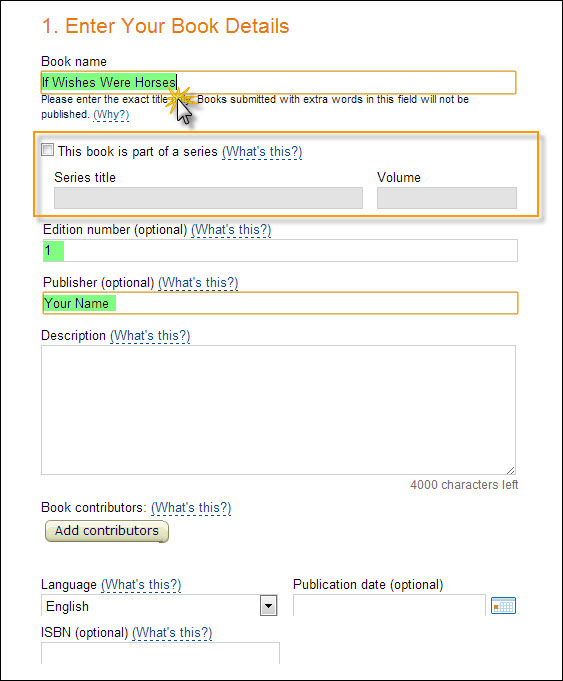 What to learn how to publish your ebook on Amazon Kindle? Here is a 9-step guide to get you started, complete with screenshots. Use this guide as a slightly more than a checklist for your Kindle publishing project. Going through all the steps will help you plan it and fit it into our schedule. It will also alert you in advance to steps you may find especially time consuming or just not up your alley, allowing you to plan for, find and hire the correct outsourcing contractors to complete these particular modules. Lots of people talk endlessly about writing a Kindle ebook: Not so many do it. If you are writing non-fiction, you need to come up with a hot topic. Checking out magazine stands, best seller lists and the Amazon marketplace itself will help you get an idea of what people are looking for nowadays. Discount books written by celebrities. Those will be heavily promoted and subsidized, and won’t give you a true picture of what’s currently in demand, topic-wise. Write an outline. It will help you stay on topic and produce a much tighter, more focused book that feels professional and reads clearly. Then sit down and start writing. Schedule it. Don’t wait for inspiration. Ruthlessly put aside your feelings. Just give yourself a minimum word count per day that you have to write: Then stick to that minimum. That’s the magic formula that published authors the world over have discovered. (The real secret? If you make yourself do this every day, and turn off your Inner Critic, it soon becomes a habit. 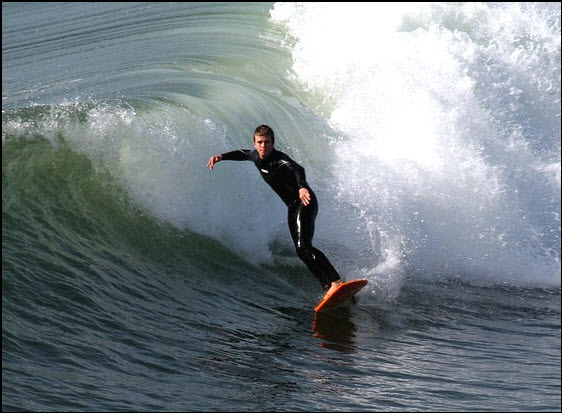 And that’s when you suddenly catch the wave and learn to surf! And what a high it is, when you can’t wait to sit down at your computer in the morning (or evening, if that works better for you) and get started. That’s how books are made. Writing your book is a huge accomplishment for many, but it’s just the raw bones of your finished product. Put the book aside for at least a week if you can, and then come back to it and begin the process of proofing and editing. Spell-check first, then proof it again for readability. Then proof it again for consistency. Then proof it again for flow. And run the spell checker a final time. If you’re new to writing and have the budget, hiring an editor at this stage can free you up to continue with other projects and get the book ready for print a lot faster. Your ebook’s cover image is one of the most important components to getting your book approved by Amazon, being taken seriously as an author – and inspiring people to buy. If you do not have solid art skills, don’t waste time or cut corners here: Hire an artist experienced in creating Kindle ecovers to produce a polished, vibrant product. Don’t use black and white photography for your Cover unless it is an essential part of your cover photo’s statement and enhances the book’s mood and premise. Your interior photographs will display in black and white on older Kindle versions, but your cover will always be competing with other richly-colored covers on Amazon’s Kindle book site. Your cover photo should be 100% original. If you hire an artist to produce the artwork only (as opposed to producing the entire ecover) make sure she signs a “work-for-hire” clause, ceding all rights to you. Do this also if you hire a photographer to produce a photograph. If you outsource through oDesk, perform due diligence to make sure the artist is not using improperly licensed stock photos. This is the sort of risk you take when you outsource through abnormally low-priced sites – but it can also help you unearth great talent. If you purchase an image from a stock photo company, make sure you also purchase the correct commercial license. But original is always preferable. So your book is ready to upload. Your ecover is also ready. You have a variety of options available as far as formatting tools go, but since you most likely created your ebook in MS Word, let’s take the easiest route – publishing it with KDP Select. Before we even begin to worry about the actual formatting process, however, you have to make sure your manuscript is Kindle format-ready. If you don’t already know how to format for Kindle and you don’t want to outsource, download Kindle’s own Building Your Book for Kindle guide. Research and know your keywords too, as well as the categories you’d like associated with your book. Finally, decide on a price for your book. Step 5. Sign Up or Log Into KDP Select. You may see a message like the one below in the upper, right-hand corner. Click on the anchor text: “Update Now”. You will be taken to your account screen. Fill in any missing information. Put your real name. You will be able to choose a pen name later, if you’re planning to write for different niches or genres under different pen names. If you don’t see the “Update Now” message, simply click on “Add New Title”. 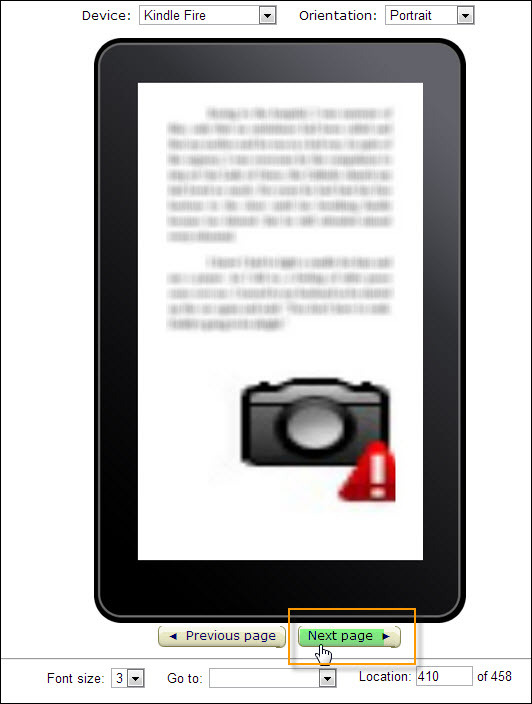 Don’t be intimidated about uploading your first Kindle ebook. You will be able to “Save it as Draft”, and no one will see it until you are ready to publish. When you click on “Add new title”, you’ll be taken to section # 1, “Your Book”. Beside it, you’ll see # 2, “Rights and Pricing”. As you can see, this phase is extremely easy and self-explanatory. Clicking on the little “What’s this?” anchor text brings up simple pop-ups explaining each step. If this is a new book, enter “1” for edition number and if you don’t have your own publishing company (something you should definitely explore once you’re comfortable with the Kindle publishing process) enter your own name as Publisher. Don’t skip clicking on each anchor link: None will take you away from your page. Don’t enter an ISBN number or Publication date for now. Verify that you have the right to publish your content. If it is in the public domain, you cannot include it in the KDP Select program, and you must disclose its status here. Next, enter up to 7 keywords (single words or phrases); then click on the “Categories” button to choose the 2 main categories in which you want your work to be located. When you click on the Categories, a pop-up will open up. Next, upload your book cover. It should be “camera-ready” – meaning all text should be in place, rather than just uploading the photograph alone. Select “Browse for image” if your cover is ready and waiting on your hard drive. 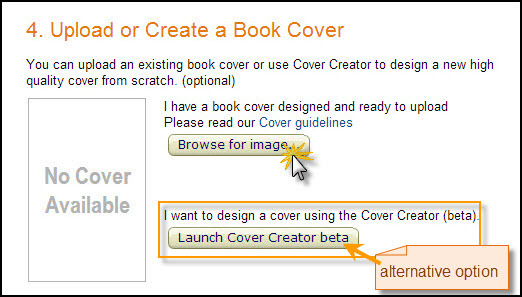 An alternative is to use Kindle’s brand new Cover creator: However, since your cover is one of the most important selling tools for your book, careful pre-design is recommended. 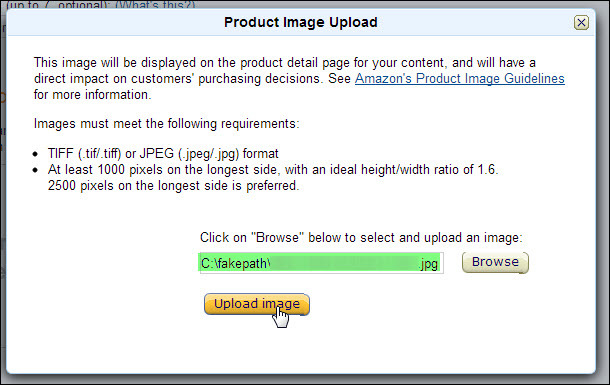 Once your image is selected and you see your filename in the pop-up, press the “Upload” button. Next, upload your book. If it contains images, upload it as a zip file. 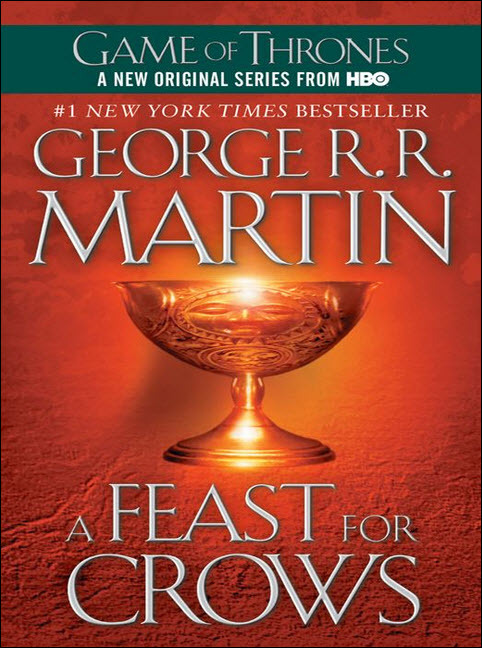 After your book is saved, you will see a green “successful” notification, just as you did with your book cover. You may also see a notice alerting you to possible spelling errors. Next, you will be offered the chance to preview your book. If you have prepared it in MS Word, go ahead and preview it online. If you have used formatting tools or prepared it in HTML, you may prefer the second option: To preview it by downloading one of the suggested tools. Once again, pop-ups are there to help you choose the right one. If you preview online, you will be able to move back and forth between pages. If there are image errors, you will see them. Once you close your Online previewer, press “Back to the Bookshelf”. You will be taken back to where you started. You will see it displayed as your first Title, along with the status and the option to enroll it in KDP Select. 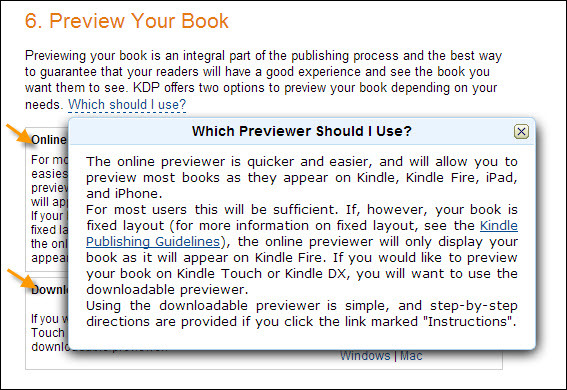 This gives you plenty of time to troubleshoot any glitches that showed up in the previewer or explore KDP Select further. Once you’ve corrected your uploaded book and are ready to “Save and Continue”, do so. You will then be directed to continue on to the next page, # 2 Rights and Pricing. In other words, if you’re charging up to $2.98, you are locked into a 35% rate. If you are charging $2.99 or more, you can choose a 70% royalty rate. 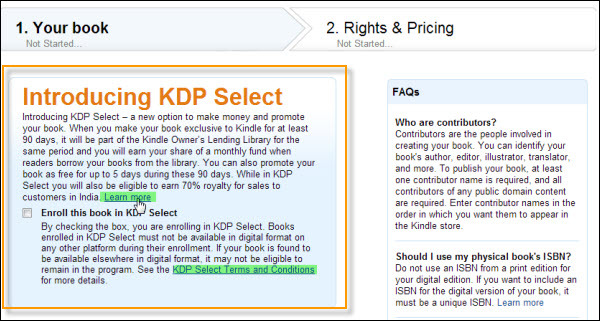 If you have decided to go with KDP Select, check their terms also. You may need to charge a different rate. Use that time to implement your marketing and promo plan – and be ready to roll when you get the green light!